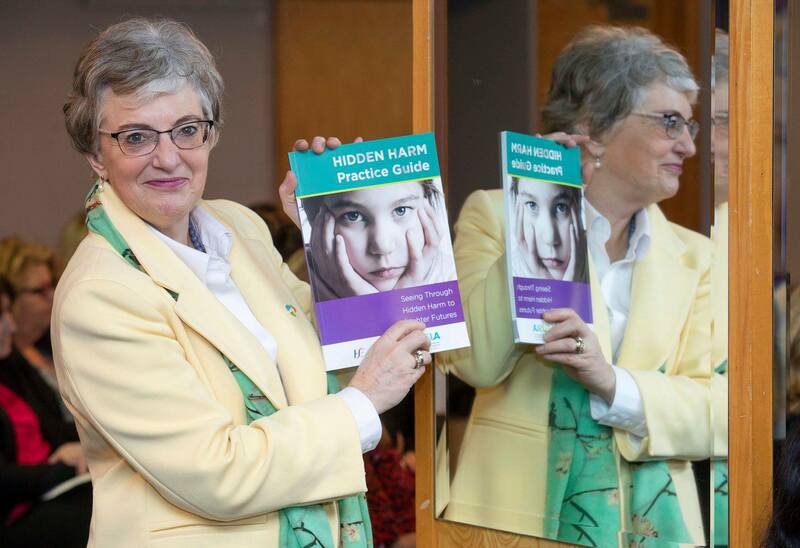 Good morning, I am very pleased to be here with you all this morning for the joint launch of the Hidden Harm Strategic Statement by Tusla, the Child and Family Agency, and the HSE. Parental substance misuse is a far-reaching issue which touches upon all corners of society, silently infiltrating the lives of so many families, mostly behind closed doors. This co-operative initiative sees Tusla and the HSE bringing their respective strengths to the challenge, is to be applauded. A joint approach which actively acknowledges the roles and responsibilities of each partner agency will enhance the supports and services available, bringing them to the families and children that need them the most. This is an issue which has been a consistent focus for my Department, one which is deserving of attention as every child deserves to grow up unhindered by the effects of substance misuse. I have been prompted by recent reports which emphasised the detrimental effects which can result from parental drug and alcohol abuse. In 2015 the Child Care Law Reporting Project reported that a significant number of cases included in their reports featured alcohol or drug abuse by one or both parents, and that usually these problems led to, or were accompanied by, neglect of the child or children. More recently, Dr. Geoffrey Shannon, identified the challenges posed by substance misuse in his audit report on the provisions of Section 12 of the Child Care Act 1991. He identified substance misuse issues as a key indicator of risk. This prompted me to make contact with my colleague, the Minister for Health, bringing the concerns highlighted in the report about alcohol and substance misuse to his attention. Signs of Safety, which Tusla has adopted as the national practice approach to Child Protection and Welfare continues to include parental use of drugs and alcohol as a core part of risk assessment. I look forward to hearing Joy Barlow MBE speak; given her extensive experience in this field, her guidance is invaluable, and we consider ourselves fortunate that she has provided her support in getting us to where we are today as we move forward with this initiative. I especially welcome the introduction of Hidden Harm which will assist in shining a light on the experiences of children living with, and affected by, parental substance misuse. It is acknowledged that many children live with such challenges behind closed doors, unknown to the services which may be able to provide support. Tusla Social Workers have long acknowledged, and are familiar with, the risks to child safety associated with parental substance misuse. The Hidden Harm Strategy and Guidance brings together this knowledge with a duty for all frontline practitioners to make early referrals to appropriate services for children affected by their parent’s drug or alcohol use. In order to protect, support and safeguard our children we must ensure those in the frontline are fully resourced to identify signs of danger. Every one providing care, support and protection to children and young people needs to be aware of Hidden Harm and know how to respond. This partnership between Tusla and the HSE is to be welcomed. It shows what can be achieved when our agencies work together. The targets are impressive with 1,700 social workers, across both agencies, and 400 addiction staff scheduled for training over the next two years. This is a concrete and real measure which will further ensure the safety and wellbeing of children, young people and families. These new training resources are a really valuable addition reinforcing for staff the devastating impact that addiction can have on children. Children and young people affected by parental problem alcohol and other substances must be supported so that better outcomes can be achieved for them and their families. Children in Ireland should always feel safe and achieve their full potential. This, I know, is our shared vision.